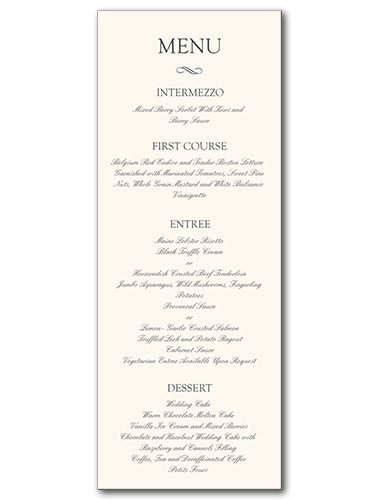 Keep things simple with the minimalist design of our Formal Attire menus. Black lettering and a white background result in something elegant, simple, and ideal for any formal or black tie event. Customize with a variety of wedding font options, or keep our suggested font and enjoy the design just how it is. Available as table cards, response cards, thank you cards, and more, so you'll easily create a fully coordinated ensemble. Formal Attire Menu For the best experience, we recommend personalizing your stationery on a desktop computer.